On the right track or running out of steam? Link's last outing, 2007's Phantom Hourglass, was a piece of portable paradise, showcasing all the DS's features with some wildly imaginative puzzles and unforgettable moments, and still remains one of the console's best titles. The Legend of Zelda: Spirit Tracks takes all that was good about Phantom Hourglass and mixes it up with some key new gameplay elements, but is it original enough to better its predecessor? Set around 100 years after Phantom Hourglass, you play a rookie train engineer summoned to Hyrule Castle to receive the royal blessing required to be a fully qualified engineer. Within minutes of your arrival everything goes awry, though without the usual kidnapping or locking away of Princess Zelda, as she accompanies you for the vast majority of the game in a rather less corporeal form than you might expect. The rest of the plot revolves around you and Zelda restoring power to the Spirit Tracks, a series of railway lines that connect various parts of the world, providing enough power for you to enter the Demon's Tower and recover Zelda's body. What this story translates to in gameplay terms is the usual mixture of travelling to towers, towns and dungeons to recover glyphs, items and unlock new areas. 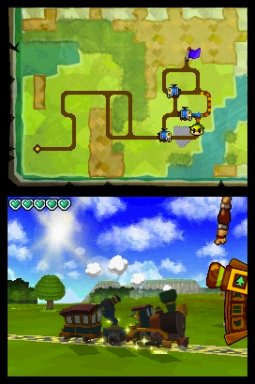 Using your rather cool Spirit Train you trace a route along the tracks to your destination, with your journeys typically a little more interesting than those in Phantom Hourglass. You'll still have Beedle floating about selling his wares and boulders and enemies to destroy, but there are now hidden rabbits to find and catch, netting you extra goods, and the ability to carry items and even passengers between destinations. Being able to trade items across the map is nothing new to the series of course, but the medium of transporting them by train breathes life into the staple trade quest. Carrying passengers is also refreshingly different – you must obey the speed and whistle signs, stop correctly at the platform and even keep your passenger safe from pirates, with the rewards for completing these quests well worth the effort. Aside from these additions, driving your train is much like skippering the boat in Phantom Hourglass – you draw a course, you follow the course, you get out and continue. The big difference really lies in the relative lack of freedom when compared to the boat: understandably you can only drive your train over existing tracks, a double-edged sword in many ways. Whilst it removes much of the oceanic meandering that dragged down PH from time to time, it also fails to recapture the sense of adventure and discovery that was so exhilarating: although there are new tracks laid at certain points, providing plenty of new areas to go to, the game has already mapped out your route for you. The other big addition outside the train is the ability to control Zelda whenever she inhabits a Phantom. This is only possible in the Tower of Spirits, a recurring level much like the Temple of the Ocean King, although thankfully there's no need to repeat previous levels to progress. Being able to team up Zelda and Link makes for some fresh new gameplay, combining their abilities to solve puzzles and defeat enemies, and being able to adopt full manual control of the Phantom at any time is a Godsend, although you can have it follow you automatically if you so wish with a tap of the “Call" button. Sadly, the Phantom's path-finding isn't as smart as you'd hope, causing it to regularly blunder into quicksand when there's a perfectly good bridge, stumble into walls and generally act with very little intelligence. You can switch to manual control and direct it yourself, but when you're in a bind and need back-up quickly it's not always an option. That said, controlling two characters in some of the game's puzzle sections results in some of the most devious mind-benders seen in a Zelda game yet. For example, Link is too weak to pass through spikes but light enough to run over quicksand, whereas the Phantom walks through spikes easily but sinks into quicksand instantly. Learning their unique abilities and putting them into practice is the key to progression as always, and the combination of careful lateral thinking and split-second timing is more potent than ever with a second character to accompany you. 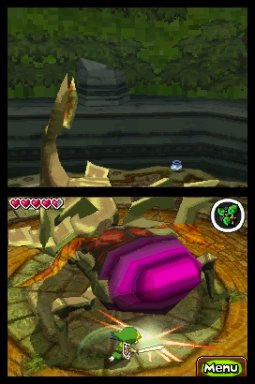 Perhaps the real beauty of this cooperative play is how sparingly it's used – it could easily have overtaken every dungeon, causing you to curse at the Phantom's clumsy blunders, but by sending Link into every temple solo it maintains that deep concentration and connection with your hero that characterises every Zelda dungeon. The items and puzzles are a mix of traditional and original – your bow and arrows, bombs and boomerangs all appear, but there's also a new whirlwind item, a whip and other items fresh to the series. Although the whip works almost identically to the grappling hook of past games, the whirlwind is more like the Deku leaf, allowing you to blow gusts of air to power propellers, move keys from faraway platforms and more. Using the whirlwind is a simple matter of aiming and blowing into the microphone, meaning some whirlwind-heavy sections require a little more fitness than you'd expect from a handheld game, though it's not quite as demanding as the Spirit Pipes, Link's new favourite musical instrument. Used in much the same way as the Ocarina and Wind Waker, the Spirit Pipes let you play different tunes using a combination of the touchscreen and blowing into the microphone. Coloured pipes sit along the bottom screen, each producing a different note, and you select one to blow by sliding it to the centre of the screen and sound a note by blowing into the mic. Different combinations of notes create different tunes, much like in previous titles, and the actual mechanic of playing it is entertaining enough, particularly with extra notes accessed using the D-Pad. The item rarely feels overused and only ever takes seconds to play, keeping it as more of an occasional feature and ensuring it doesn't outstay its welcome. Sadly, the rather addictive online multiplayer mode of the first game has been removed, replaced by a local multiplayer only affair that's similar though not quite as good. Thankfully you can play it in single-card download play, although it's still not quite a match for anyone-anywhere WiFi Connection gaming. There's also a Contact Mode, something we haven't seen in a DS game for a while, that lets you seek out other DS users and exchange treasure with them through the air. It's disappointing to see online play taken out all together as it was a nice little bonus in the first title, although there's more than enough single-player content to ease the pain. 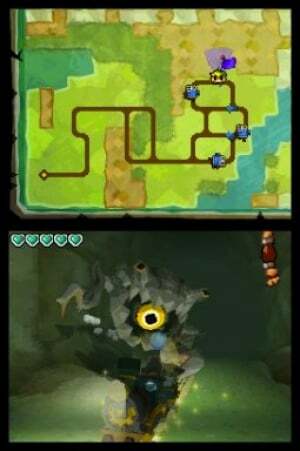 Whether in battle or on the map, the controls are exactly the same as those in Phantom Hourglass, being controlled entirely from the touchscreen with occasional buttons for calling up the map or using items. The swordfighting is still a little unreliable when taking on large groups of enemies, as sliding and tapping to strike sometimes results in Link merely moving to the point tapped rather than bringing down his sword with the mighty thunderous strike you imagined. 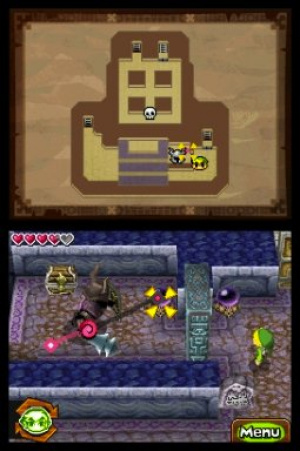 There are a few tweaks here and there – tapping an item to interact with brings up a highlight around it, for instance – but there are no huge differences and Phantom Hourglass veterans will pick it up right away. Writing on the map is as intuitive as ever, and there are a few new puzzle solution inputs instead of simply answering questions, but on the whole it's the control scheme that Nintendo more or less nailed the first time around. In fact, you could say that about almost the whole game – it's almost the same game that they got so right last time. You may be on a train instead of a boat, and get a whip instead of a grappling hook, but they're really just different ways to join the same old dots. Zelda games have always been very good at teaching you to recognise patterns and puzzles without making them seem obvious and that certainly applies here. Sliding blocks, unlit torches, using the boomerang to hit switches in order – they're all here, but some fans may feel that they're a little too familiar this time around. 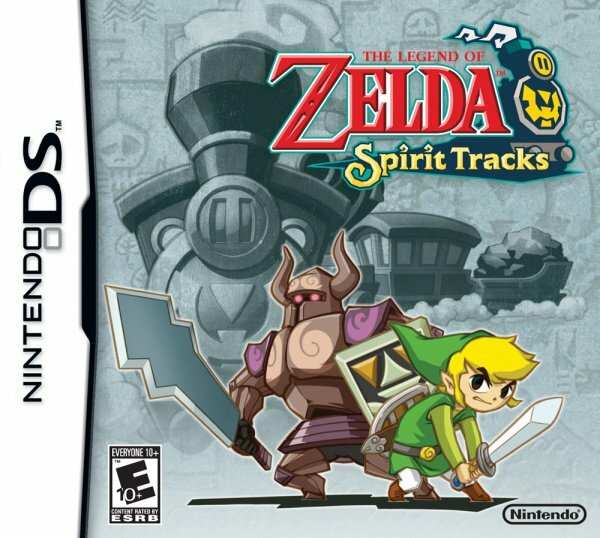 That's the main problem with Spirit Tracks – the quality is undoubtedly there, from the enjoyable side-quests to the devious dungeon puzzles, but whereas the Zelda series used to be synonymous with ingenuity and originality, Spirit Tracks arguably innovates much less than Phantom Hourglass did. But that alone doesn't mean it's not a classic game. Indeed, there's an awful lot to recommend in Spirit Tracks – it's a much longer quest than Phantom Hourglass, with plenty of optional extensions if you want to catch all the rabbits, acquire all the train parts and so on. The controls are smooth and there's a good mix of touchscreen, button and microphone inputs, though when things get hairy it does become a bit fiddly to switch between Link and the Phantom. Graphically it's still got a nice style to it, with good animation and nice facial expressions, although a few blocky textures and some occasional slowdown let it down. Musically it remixes the traditional series themes with new instruments; a nice metaphor for the game as a whole, really. If you can't get enough of Link's adventures, you'll find plenty in Spirit Tracks to satiate your appetite for sliding block puzzles, treasure chests, trade quests and the like. Don't expect huge surprises or stacks of completely new and innovative content, but do expect some new tricks from old items. It's a quality game as was Phantom Hourglass before it, and even though at times it feels too much like a retread of past games, it remains a thoroughly enjoyable jaunt through Hyrule and puts most other DS titles to shame with its overall quality. Huzzah. Prosody's review gave me another reason to buy this game! I cant wait for this tomorrow. It will sure be fun, who reckons I can beat it in a day?? This game is going to be so fun!!! I can't wait! What do you mean by "Link is too small to pass through spikes"? Yay, I'll buy this when my DS gets fixed. Too bad for the missing online mode. Well I'll have a days headstart on you so neurgh. Until I saw that you got it two days ago. Ouch. Aww man. There's again the "centarl dungeon" that pretty much ruined the otherwise perfectly ok PH. But according to the review, it seems a lot better (or even enjoyable!). I like Zelda, and there's no way I'd give this a pass, but there's also the Bowser's inside story, which one now and which one later? @Aviator - Do you have a hidden hour between 23 and 24? So it's Phantom Hourglass on a train? Are you telling me I can't even make really dumb jokes about Link On a Boat this time around to entertain myself? Poseidon look at me! Because I need the self-entertainment, as PH was just kinda....blaaaah. Y'know what, I think I'm gonna skip out on this one, tbqh. Zelda just isn't fun for me anymore, not like it used to be. And that makes me sad, but there are just more important games for me to buy now. Cool, I thought it'll get 10 out of 10, but 9 is still a good score. I'll get this game for sure. I've had this for days =P It is pretty fun though, I'd go with 9 as well. Good review. Probably get this after Christmas. Good to hear the hub temple isn't as bad as it was in PH (ew). Good for the people who liked Phantom Hourglass. I still haven't finished it, and I got it last Christmas! I have never played PH, but hopefully I will be getting ST sometime today. The fact there is no online multiplayer is dissapointing, but currently my DSi cannot connect to the internet. If my DSi is ever able to connect to the internet, I might buy PH just so I can try the online multiplayer myself. I just hope the stylus controls are good in ST, that's all I'm concerned about. Great review! I loved Phantom Hourglass, and I can't wait to get this one! I really loved Phantom Hourglass, it was one of my very favorite Zelda games, and I'm really looking forward to playing this. I think for anyone other than long time Nintendo fans, who have likely played every single Zelda game and therefore might find some of this a bit familar, this would probably be a clear cut 10. @Rezon but then, how often is IGN right about Nintendo Games? :/ I really don't think that the Ocean Temple in PH was that bad, but then again, I have the patience to play paper airplane chase for 3 hours straight. I'm afraid I'm getting BIS before this, but I will definitely get this after that. @110electro - IGN as a whole is not bad. Certain reviewers are of poor quality, but I think Bozon does a good job. And I agree, the Ocean Temple wasn't as bad as people make it out to be. No, it's not bad as a whole, but I generally just trust Nintendo Websites for Nintendo games. I must have seen a bunch of bad reviews. They said new super mario Bros. wii was just Nintendo playing it safe because there is no wifi, and they said it was completely unoriginal particurally because the extra 2 characters are toads. Ocean Temple isn't all that bad in PH just repetitive since you have to go through all of the same rooms every time you go deeper into it. But from reading this review it seem they fixed that problem which will make getting to the final boss a lot if he is in there. I can't stand having to wait until Christmas to get this game! Doh, I have not even bought Phantom Hourglass yet, so this is a great review for me, with loads of depth, which is just what I need to decide which one to buy first. This is particularly with you saying "it’s almost the same game that they got so right last time". I know that the comparison with its DS predecessor is a compliment in many ways, but I think I will wait for a bit before buying it and perhaps get Phantom Hourglass on the cheap first. I like the train engineer story, it is a shame that fixed routes has meant that the spirit of the adventure has been lost a little with the change in transport, but the idea of more complex puzzles as a result of controlling both Link and the Phantom is promising. Ever since Super Mario 64 any Nintendo game that includes catching rabbits is likely to get my nostalgic juices flowing, too. 91% ONM, 9.3 IGN (yes, even those depressed gamers) and now 9/10 NL. The hits just keep on coming. PH was one of then top 3 games, if not THE top game, on the DS. Can't wait for this one. I'm skipping this one. I'll probably end up playing it eventually, but it'll be because I borrow it from a friend, not because I buy it myself. Instead I'm getting Link to the Past for Christmas! I'm very excited about this, because I like the old-style Zelda games better than the new DS style. Why did you have to review it? It only makes me want the game so much more. I was disappointed in Phantom Hourglass, but that won't stop my Zelda fanboyism from making me buy this game. Pass. I didn't like PH that much, so I won't be getting this. Want this game so much! Have to wait till Christmas, though. I'll add this to my wishlist. It looks to be a good game, but I won't be picking this up. I liked PH, but that got a little bland and boring really fast to me. Plus I'm very busy (game-wise), with NSMBW and Pop Island. Also I restarted M&L:BiS, and started a second save file of Super Mario Galaxy and NSMB (DS). Plus Army Defender and Scribblenauts when I get bored. So I'm not picking this up, maybe in the future, but not now. I'll definitely be picking this up after Christmas, this and Bowser's Inside Story. For sure... but then there's also Crystal Bearers and Tatsunoko vs. Capcom. D= Why do so many good games come around right before or right after Christmas? "Sadly, the Phantom’s path-finding isn’t as smart as you’d hope, causing it to regularly blunder into quicksand when there’s a perfectly good bridge, stumble into walls and generally act with very little intelligence." Thats not a bug, its a FEATURE! what do you expect? it's being driven by a woman!! ...you know, I'm sure someday I'll regret skipping out on Spirit Tracks, but for now, I still feel that made the right choice. Meh, if you ever regret it, you can always, you know, just buy it. It's not like the game will cease to exist, even if you have to get it used. I for one am almost finished PH (just got a DS this summer), and I love it. The only time the time limit dungeon gets on my nerves is when I'm trying to explore to get all the treasure chests. Luckily, I'm not quite done yet (Where are you last ten Power/Courage/Wisdom gems? ); it makes the wait for Play-Asia to get ST in stock a little less painful. I wish they had a button option for the blowing in the microphone parts. Who wants to be blowing on their DS in public? It's not really a huge problem for me now, since I play at home. Last year when I played a lot on the metro it would have been a pain though. I loved the Ocean King temple in PH. You guys don't know from fun. You guys don't know from fun? I'm not sure what you mean by that, but I loved certain parts of it also. I loved running from the phantoms, shooting them in the back, and I especially loved trying to find a faster way every time. Agreed with electropercent. Like most though I didn't enjoy the time limit 'feature' too much. That being said, Phantom Hourglass was still insanely fun, and from what I've heard Spirit Tracks is even better. What a great game this is. Alyhough it will probably not leave as big an impression as Phantom Hourglass as it is very similar. I suppose it's a turn of phrase not often used; here's an explanation / discussion. Great review; I can't wait to play it after going to the midnight launch at the Nintendo World Store on Monday. Well, I have Phantom Hourglass to finish up so I will wait until the time's right for Spirit Tracks. I still say Phantom Hourglass is much better, PH was really easy but ST just ventures into brain-dead territory in my opinion. Not to mention it seems to be quite a bit shorter and has less lasting appeal. 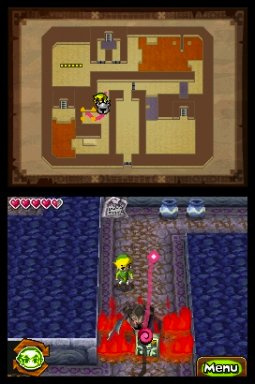 I would think Phantom Hourglass would be a good example of how to improve on the original, but unfortunately it IS the original. The one redeeming feature is the great storyline, it's more than just the average Zelda story. Not terrible though, just more like a 6 or 7. Nice review by the way. Sounds like Majora's Mask all over again; Not as innovative, but a better, more polished game overall. For me though, the changes made to the game are definitely enough to pick this up. While i'm no fan of touch screen only controls, I'll get over it. The presentation is beautiful (the theme in Spirit Tracks' launch trailer, I suppose the main theme in the game, is already stuck in my head), and the fact that Zelda is along for (at least some of) the ride for the first time ever is huge to me. I like how the Train looks like it plays too; it looks like a game of Pac Man to me, almost, changing your path to avoid enemy trains and stuff. I don't really care that it's less "open" than the boat in previous games; it still looks engaging and it's different. What? Besides how innovative the game engine itself was OoT wasn't that innovative. It was also a ton more polished than MM. Majora's Mask is a lot more innovative than OoT. hey Vinsanity, does your username refer to Vince Carter? Whenever I wanna get a DS game in the Fall, I JUST HAVE 2 WAIT UNTIL X-MAS!!! I`m just an ordinary nine-year old girl. That is a genius at computers, phones, Wiis, u name it! I SWARE THIS IS TRUE!!! I just got ST for x-mas, and I am stuck on a part. I am at the part where you have to find the Lokomos guy in that grassy place, and I can`t get through the brown blocks. How do you get through the brown blocks? @110percentful How do you get through the brown blocks to find the Lokomos? but i wish there was multiplayer on Wifi..
Love this game. I find it to have one-upped Phantom Hourglass in nearly every way. It's almost like they took Phantom Hourglass and fixed every single problem that that game had, like that HORRIBLE and repetitive Temple of the Ocean King. 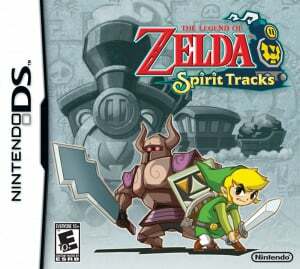 Spirit Tracks retools the most dreaded part of Phantom Hourglass (and the part that killed most of the fun factor for me) and turned it into the most unique and fun aspect of the game. I just picked up a used copy of this at GameStop and (being a Zelda fan over the years) of course, I love it so far... Just wondering (and this has always bugged me) can someone provide a timeline of where the different Zelda games fall? (Like, where does this title fall in the scheme of things, right after Phantom Hourglass? and what came before that?) Just wanting to know where all the different stories are going to wind up and where they all fit in.. There's a possible chance that I will get this, it looks good. I am Glad they got rid of the online. Alot of people I played with used Action Replays. Phantom hourglass suckssss compared to this! Phantom Hourglass was incredible, and this one is even better. This is definitely one of my favorite DS games. not sure if I should buy. I'm very tempted. Spirit Tracks is a great game! I bought it in September, but I still didn't beat it. But it's a good thing because it's not like Mario where you beat it in one sitting. I am just starting to realize how ingenious the puzzles are! Especially with the phantom, oh yeah, good stuff.... The stylus controls are real good and Nintendo knows how to plant stylus controls (which would usually be put into recent DS puzzle games that in my opinion are fully fun) into action-heavy fun. There maybe minor problems like slow-downs during train fights or some of the Lokomoto's songs are tricky to get done. The game is still more than very impressive with its awesome stylus use and great puzzles. 9.5/10. Sorry I meant in the sentence in that the parenthesses that the recent DS puzzle games are NOT fully fun.